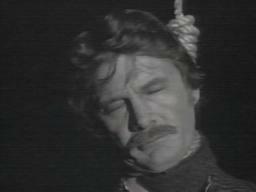 Night Gallery: The Waiting Room (1972) [Sam Dichter]: Hanged (off-screen) by a lynch mob. His body is first shown (with his face covered by a hood) hanging from the tree as his ghost rides past it towards the afterlife "saloon," then is shown again when he rides out of the saloon and removes the hood, discovering it's his own body. Night Gallery: Hatred Unto Death (1973) [Grant Wilson]: Bludgeoned to death with a statue by a gorilla (George Barrows in an ape suit).